Gracie Lee on Arts & Letters! THIS FRIDAY (May 25 at 7:00 p.m. CST), the show I taped in January in Little Rock goes LIVE on NPR’s Arts & Letters. This is such a huge thing for me. And I’d love for you to listen. After all, YOU helped make this happen by being so supporting of The Accidental Salvation of Gracie Lee. You’ve told your friends about the book, invited me to your book clubs, written Amazon & Goodreads reviews, and basically inspired me to keep plugging away at this writing thing. If you’ve never heard an Arts & Letters show, get ready for a treat. The show is produced by professor Brad Minnick of the University of Arkansas at Little Rock and is part of KUAR public radio. Arts & Letters highlights arts, humanities, and social sciences, something the world needs more of in spades. Right? No kidding, the talent generated from such a tiny, rather nondescript studio is absolutely incredible. I witnessed it for myself. I hear it with each episode. To have my story showcased on Arts & Letters is an honor on par with the first time I saw my book on the shelf at Barnes & Noble or the Fayetteville Public Library. Our family has always had lots of Christmas traditions. Mother-daughter traditions. Boon Chapel traditions. Gracie-Abby sister traditions. Visiting The Enchanted Forest at Goldsmith’s in Memphis was one of our favorites. Each year when we went, Momma dressed us in red velvet with white tights and black patent shoes, not because The Enchanted Forest was a dress-up place, but because Santa Claus waited at the end of our forest visit. Having a chance to talk with Santa, to tell him our greatest Christmas wishes, and to take a picture with him was reason enough to have clean hair and look fancy. Something interesting about Goldsmith’s? During the non-Christmas part of the year, the forest area was nothing more than the basement of the department store. 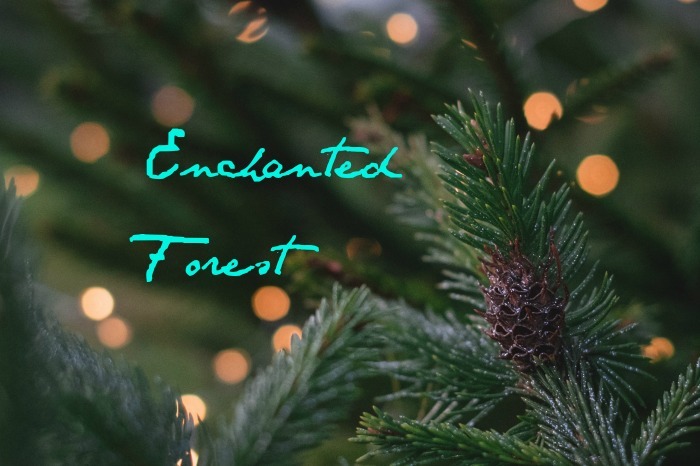 But at Christmas, just beyond the double doors past the men’s department, the Enchanted Forest became as magical as Alice’s Wonderland or Narnia, all those pixie-dust-sprinkled places. It’s a world gone Lord of the Flies. All I have to do is look outside my kitchen window to see it. In my garden (which has basically been unattended since my accident), the bully plants run amok. There’s been no one to reign them in, cut them back, pull them out by the roots, keep them in their place. Bullies need stewards. They tend to be very Machiavellian. The bullies in my backyard.